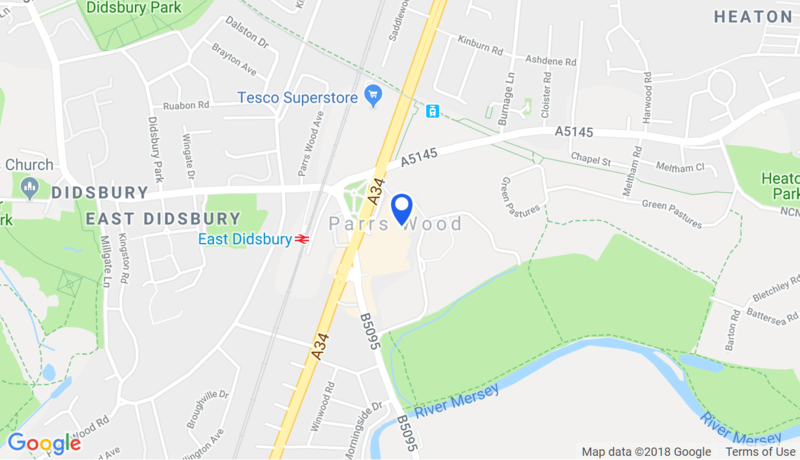 The postcode for Parrs Wood is M20 5PG, and we are located on the left just off the main A34 (Kingsway) around 5 miles from Manchester City Centre in Didsbury, with FREE parking available for our customers. Parrs Wood are delighted to be awarded the Park Mark award- given to parking facilities that are judged to meet strict local police criteria. Parrs Wood is also just a short walk from East Didsbury train station. Alternatively, click HERE to see information on how to get here on the Metrolink. We have fantastic regular public transport links on routes 50, 142, 42, 42a, 45a from Manchester city centre.